We’re referring of course to Popeye the Sailor Man . One can of the green stuff and he turned into muscle popping tornado of energy. 1. Loaded with vitamins like A, K, D, and E and and a host of trace minerals. In a recent study on the relationship between risk of prostate cancer and vegetable intake (including such healthy vegetables as broccoli, cabbage, and brussel sprouts) only spinach showed evidence of significant protection against the occurrence of aggressive prostate cancer. All those minerals helps to balance off the highly acid diet which most of us subject our bodies to and which drains our energy, increases obesity and a host of other health problems. The carotenoids found in spinach protects against eye diseases such as cataracts and Macular Degeneration. Studies have shown that those plastic tubs of spinach being exposed to even artificial light in the grocery store are actually help keep it from spoiling. This indicates the spinach is still metabolically active and fresh. Tip #1: Make sure you only choose organic spinach. Non organic spinach is on the list of top foods with lots of chemical pesticides. You can assume that canned spinach is NOT organic. 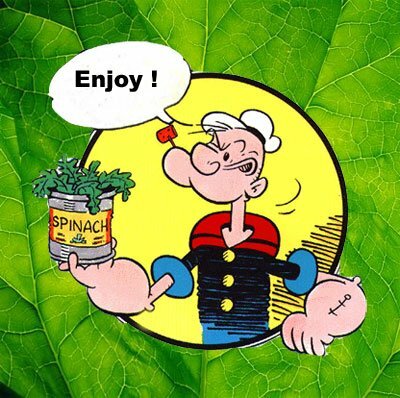 I can’t imagine anyone eating canned spinach anyway but since we mentioned Popeye I thought I had better mentions that. Tip #2: Choose the GREENEST looking spinach you can find. 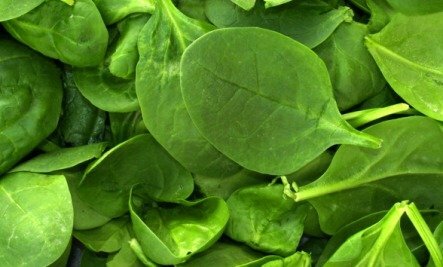 Probably you would have anyway but studies have shown that the greenest spinach has the most vitamin C.
There is much debate whether the oxalates in spinach would have this kind of effect but just be sure, if you have a pre-existing kidney problem, better to consult your doctor before eating too much. Spinach Salad With Walnuts A very yummy salad. Diana’s Green Smoothie With a Difference: Easy way to get your spinach into your day. Copyright © Randy Fritz You are welcome to share this article with anyone who you think may benefit from this information as long as you give credit to Real Food for Life by including the link to the home page www.RealFoodforLife.com or the direct link to this post. Hi, there. I LOVE spinach and use it almost daily. I even have it for fast breakfast smoothie. I do not measure , I just put a bunch of spinach in the blender, about 1/4 cup of blueberries ( fresh or frozen), about 3 frozen strawberries ( if they are large), heaping tablespoon of ground flax seed, scoop of protein mix I use and about one cup of almond milk. I blend it until just ground and enjoy. A complete meal in a rush in a glass. Hi Christine: i agree with you about lettuce. It tends to be mostly air and water. I don't eliminate it though since every food has it's own unique goodness and benefits. Romaine lettuce is less air and water than iceberg.